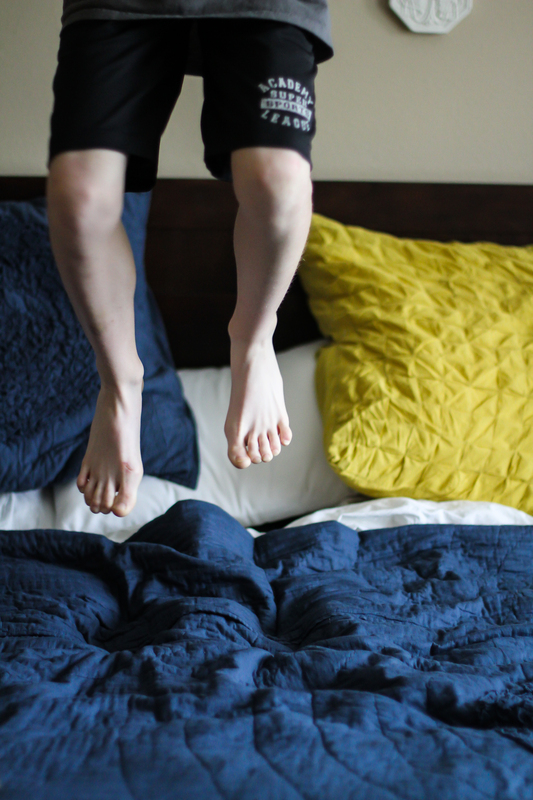 Sure enough, my 10 year old agreed with me that jumping up and down on my bed would be a perfect way to illustrate foolin’ around for week 13 of this blog. In fact he didn’t need any persuading at all! It took a few attempts, and some trial and error, but one completely messy bed later I had my shot. The more interesting part perhaps of this blog entry is how I achieved this image. At 4:30 in the afternoon, with school over, snack eaten, and big brother picked up from middle school, it was pretty dark in this room at the back of our house. I open the curtains and blinds to let in as much light as possible, and to avoid decapitation (!?! ), turned off the ceiling fan. I knew that I would have to use a lens and therefore aperture combination that would allow me to have a high enough shutter speed to freeze the action. I chose my 50 1.4 lens paired with my Canon DSLR. I set my ISO at 2000, and then tried a few aperture and shutter speed combinations. Initially, I didn’t want to set my aperture at 1.4 because I knew that the extremely shallow depth of field would make it very difficult to capture a crisp image of Will’s feet while they were in motion. However, when I reviewed the images I had taken in Lightroom 4, it wasn’t the f/2.0, ss 1/200, ISO 2000 picture that turned out the best, but this one with my settings at f/1.4, shutter speed 1/160, and ISO 1000. Post processing, I increased the contrast, clarity, and saturation and then adjusted the sharpening and reduced the noise, which was a consequence of the high ISO. Bonjour! This week, I am once again featuring a photo taken in France. This ‘Foolin’ Around’ shot was snapped by my daughter during her weekend travels. 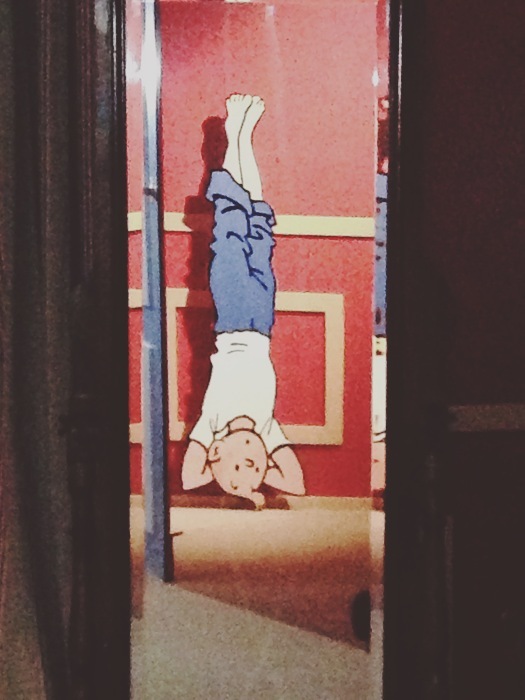 Not that we haven’t had a ton of fooling around here, with my son on his two week spring break, but the string of photos my daughter sent me from The Tintin exhibit won my heart. Les Aventures de Tintin is a series of comic books created by Belgian cartoonist Georges Remi (1907–1983), who wrote under the pen name of Herge. The series is one of the most popular comics in Europe. While touring the Chateau de Cheverny in the Loire Valley, Libby and her Host French Family also toured the permanent Tintin exhibit titled, The Secrets of Moulinsart. Located on the castle’s grounds, the interactive exhibit’s building features artwork and information about Herge and the world of Tintin. Belgian comic book creator Hergé used Cheverny as a model for his fictional Marlinspike Hall (Château de Moulinsart in French), the residence of the character, Captain Haddock. As I mentioned above, the exhibit is interactive and I must say, from looking at all of Libby’s photos, very comical! 😉 Libby continues to impress me with her photo composition and I loved ‘seeing’ this exhibit through her eyes. This photo, taken with the iphone 5, was very dark. It appears she was looking in through the door of an artificial lit room from a dark hallway. Definitely not the ideal lighting. So for the edit, I first brightened and sharpened in snapseed, and played around with the focus. Then, looking to reduce the noise a bit and looking for that trendy mat look, I ran the photo through a VSCO edit and faded a touch. I was happy with the outcome considering how dark the original photo was. And in the end, it will serve its purpose as one of the many memories of Libby’s first French Exchange.